As always at the end of the month there are a few items still lingering on the 'to do' list. Rather than add then on to the list for the next month I'm giving them a bit of space here. 1. Spent a good deal of July agonising over a review of Ottolenghi The cookbook. This is a book I love. There is something about it which is invigorating and exciting but I found it very hard to put my finger on just what it was that made it so. In part my enthusiasm stems from having eaten at 'Ottolenghi' in Islington and so going through the recipes and the photographs in the book I can relive that experience, but there is also something about the generous use of ingredients and the imaginative combinations which give the recipes a vitality and joyousness which is sadly lacking in many cook books. You can read the final result at The Gastronomer's Bookshelf. 2. Not too many notable eating out experiences of late although we did encounter something called 'Watermelon crème brûlée'. Ordered in the interests of gastronomic enquiry this dish turned out to be a thin, pink, slightly vegetable tasting custard topped with a crisp caramel shell – not something to be repeated at home or anywhere else for that matter. Where do people get these ideas? 3. 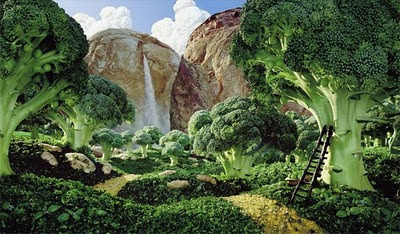 I have an on-going fascination with food and art – food used to portray non food (as in the photograph above – for more Carl Warner see here) and vice versa (like crocheted and knitted food, food made from felt, sculpture etc), food in paintings (nothing better than a good still life) and food in literature and the movies. Wouldn't it be fabulous if Sydney could have an International Food Film Festival – they have one in New York, they have one in Chicago, they have one in Coffs Harbour so why can't we have one here? 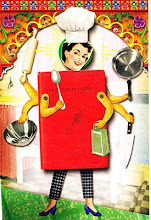 Cookbooks - useful or good?